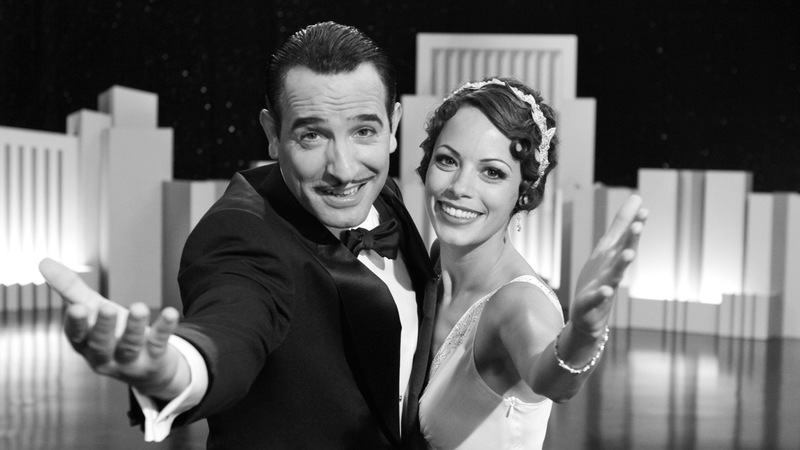 In today’s movie world of big explosions and 3D, a black and white, silent film may seem a little old-fashioned, but “The Artist” is a breath of fresh air. The story follows silent film actor George Valentin (Jean Dujardin) in the late 1920’s as the film industry stands at the brink of new sound technology. Valentin is charming and the public loves him. When “talkies” become all the rage, though, actors like Valentin are cast to the side in favor of new faces. Toss in the stock market crash in 1929 and the actor’s world is flipped upside down. At the same time, a chance encounter outisde of one of his film premieres launches the career of Peppy Miller (Berenice Bejo), an up-and-coming actress for the talking pictures. While those two actors may not be the most famous names you’ve ever heard (both are French actors, although Bejo has been seen in American movies like “A Knight’s Tale”), the film also has big names like John Goodman, Malcom McDowell, James Cromwell and comedic actress Missi Pyle (who got her start in acting about 15 minutes from where I’m currently writing this review). There are two things that make “The Artist” great to watch. First, it is a perfect homage to the golden days of silent film. Making a silent movie these days could be perceived as a gimmick of sorts, but the film does so much more than just cut out sound. It captures the spirit of the 1920’s. The glitz and glamour of big premieres, fancy dresses and bright lights. And the situations that these characters find themselves in are pretty spot on to what was going on at the time. Secondly, the film works for today’s audience. Of course it is different from what we’re usually watching these days, but the work of the camera is more fluid than, say “City Lights.” It’s not like the camera is left on a tripod for half the movie. Writer/director Michel Hazanavicius (who is up for 3 Oscars next month) does a great job of making a film from a different era flow into a 100-minute presentation that audiences today can enjoy. The technical aspect of the film is met with equal achievement from those in front of the camera, as both Bejo and Dujardin are marvelous. The former is vibrant, funny and sweet while the latter takes the audience from laughter to despair and back again. Around the 80-minute mark my eyelids were starting to get a littly heavy, but that was more on me than the film or its story. Despite only being given about 30 lines of dialogue from title pages, the film is easy to follow through character expressions and common sense. And a killer score also helps things out. Overall, “The Artist” is a charming film delivered in excellent quality through top notch production. I’m not sure if I’d call it the best film of 2011, but it’s sure going to make an argument over just about anything else. This entry was posted in Film, Reviews and tagged actors, award season, black and white, film reviews, flappers, jean dujardin, john goodman, missi pyle, old hollywood, silent film, stock market crash, studios, talkies, the artist by will. Bookmark the permalink. This was a very well-made film and had its moments where it captures the whole spirit and essence of the silent film era but it’s not that life-changing experience that everybody says it is. Still, a good flick though and I do think it does still deserve the Best Picture Oscar just because I don’t think The Descendants would be a very good winner that will last for the ages. Good review. I really liked this movie (as evidenced by the grade) but I think people are latching onto it because this hasn’t been too strong of a year. There’s been a lot of above average-good films but no major players. As you said, it’s very well made, but it’s also something very different and unique so it sticks out in people’s mind. I would also much rather have this or Hugo win than The Descendants (although that was a great film).